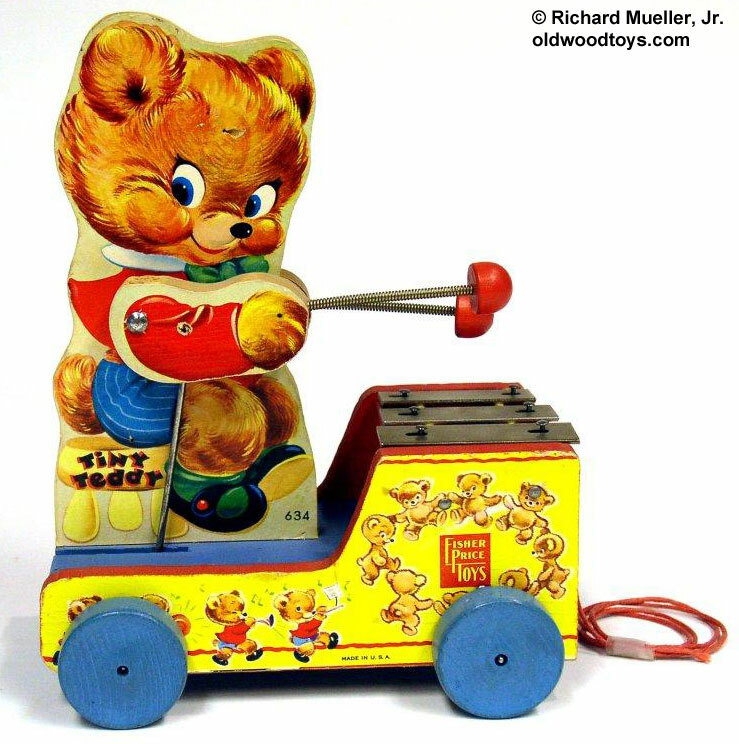 Description: In 1946 Fisher-Price introduced the very first toy featuring a teddy bear playing a 5-note xylophone in the #752 Teddy Xylophone. 1950-1954's #777 Teddy Bear Zilo features the same movement and 5-note xylophone but a different teddy bear lithograph. 1955 rolled around with the #634 Tiny Teddy featuring the same teddy bear design used on the #777 but with a 3-note xylophone and a colorful platform. FPT4302 - Rectangular wooden platform with a 3-note xylohpone on the front and a wooden cut-out teddy bear on the back. The bear has paper lithographs on the sides of a brown bear with big blue eyes, a red shirt with a white collar and green bow tie, blue and white striped shorts, and black shoes with green socks. Bear has seperate wooden movable arms with paper lithographs on both sides of red sleeves and brown bear hands. Each arm has a mallot attached to the hand. When pulled, the the bear moves his arms to stike the 3-note xylophone with his mallots. The platform has yellow paper lithographs on the sides with pictures of bears playing musical instruments and dancing around the Fisher-Price logo. The platform rolls on 4 blue wooden wheels. Measures 6-1/4" long, 8" high, 4-1/4" wide. Also see 1946-1950 #752 Teddy Xylophone. Also see 1950-1954's #777 Teddy Bear Zilo for a larger version of the #634 with a 5-note xylophone and different platform. Also see 1962-1966's #635 Tiny Teddy.